With four national forests and 22 state parks, Alabama offers infinite opportunities to spend a weekend in the great outdoors—whether you prefer to find a campsite in the woods or pitch a tent practically on the beach. Alabama’s state parks typically play host to tons of amenities, often including restaurants, lodges, equipment rentals, and nature centers or museums; many state parks also provide access to incredible backcountry experiences. Other public land—encompassing nearly 667,000 acres of Alabama—boasts much of the same fascinating history, much of it with the Civilian Conservation Corps, but in the company of fewer other visitors. Regardless of where you plan to pitch your tent (and whether you plan to drive, hike, bike, or boat there) the time to hit the trail is now: Temperatures are cooling off, bugs have dissipated, and the fall camping season is in full swing. The wilderness is awaiting adventurers—and if you’re a camping newbie, here’s a rundown of some of the best spots for camping in Alabama. There is a ton to do at Oak Mountain State Park, Alabama's largest state park. At nearly 10,000 acres, Oak Mountain is Alabama’s largest state park—and whether you’re looking for a relaxing getaway or a more rugged, off-the-beaten-path experience, this park has you covered. Oak Mountain boasts tent and RV sites, along with excellent hike-in backpacking sites for parties of up to eight. It’s not just great camping: In addition to its 21 miles of hiking trails, this park’s mountain bike trail system was named to the international Epic Trail list by the International Mountain Bicycling Association in 2010. Oak Mountain rents canoes and SUPs for use on one of two 85-acre lakes—and, for those not ready to quite give up the summer, a beach specifically for campground guests. Looking to skip the crowds? Open Pond Recreation Area has fewer amenities than many of Alabama’s state parks, but it also sees far fewer visitors each season—and, at just $8/night for a tent site, it’s a bargain. 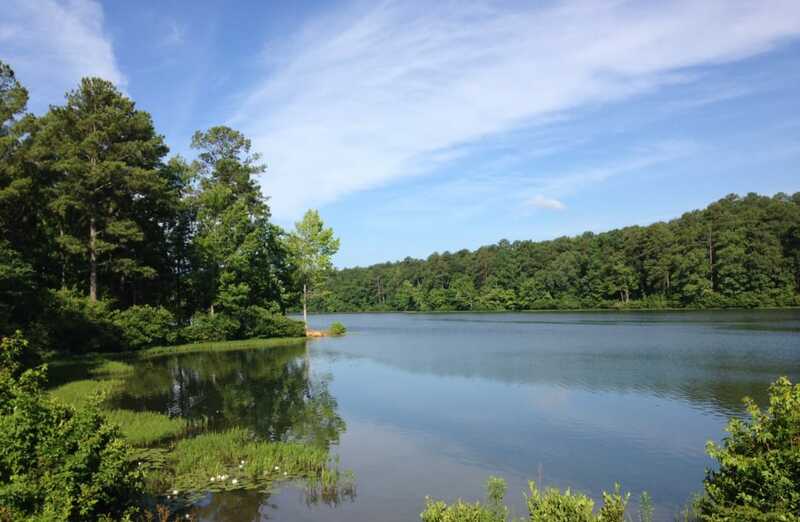 Sites boast panoramic views of the area’s namesake pond, as well as access to fishing, boating, biking, and hiking on the Conecuh Trail, which covers 20 miles of Conecuh National Forest. The trail—built by the Youth Conservation Corps—is open to backpackers, though it’s crucial to coordinate backcountry trips with the District Office to avoid scheduled deer hunts in the adjacent wildlife management area. Cheaha is the place to go for amazing views. 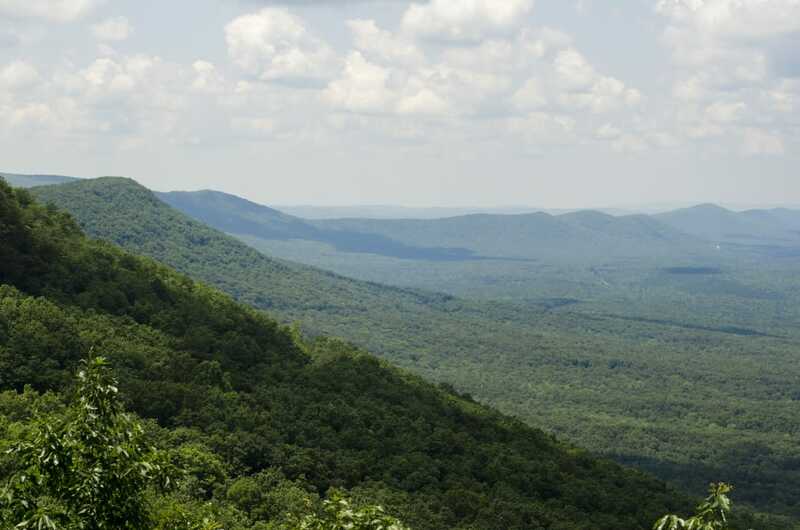 Alabama’s oldest state park is also one of the best spots for great views—it encompasses the 2,413-foot Cheaha Mountain, the highest point in the state. The Civilian Conservation Corps built a stone observation deck on the summit of Cheaha in the park’s early days; visitors can still take in the sights from Bunker Tower today. Cheaha is also the starting point for the 335-mile Pinhoti National Recreation Trail, which winds through Talladega National Forest on its course to the Appalachian Trail. The park’s semi-primitive tent sites allow campers to park adjacent to their spot along the Picnic Trail, while primitive sites feel isolated from the hustle and bustle of the park. Reserve either type in advance for the best spots. Looking for a unique experience? Head to the caverns. 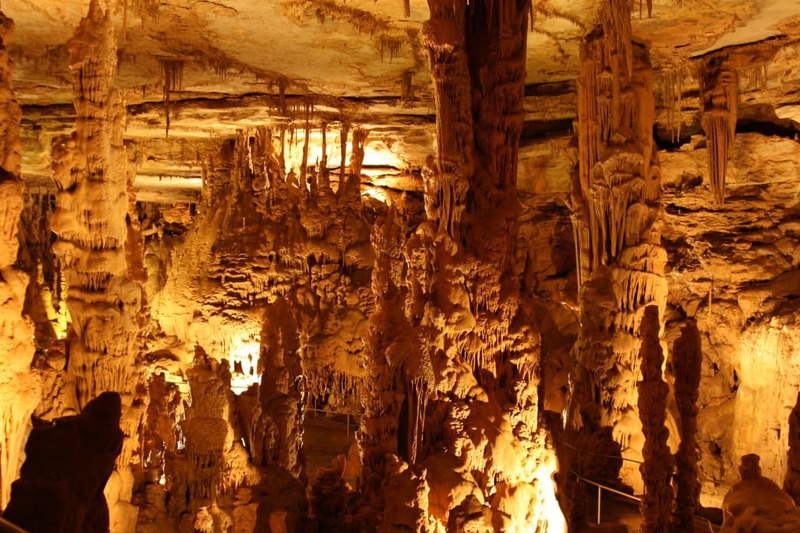 Cathedral Caverns is no longer called "Bat Cave," but the moniker is still appropriate: The park’s main feature is its limestone cave system, which contains a forest of stalagmites—including Goliath, one of the world’s largest at 45 feet tall and 243 feet in circumference. The park offers both improved and primitive campsites—no reservations required, and, unlike many state parks, no minimum stay, even on weekends—along with a backcountry site on Pisgah Mountain. Save a few bucks thanks to Cathedral Caverns’ cheaper camping fees (a benefit of its off-the-beaten-path nature), and splurge on a 90-minute cave tour, offered several times daily year-round. With 12 miles of waterfront, Magnolia Branch is one of the best spots in the state to enjoy kayaking, canoeing, swimming, fishing, or tubing just steps from your tent. The reserve does have RV hookups and a few tent sites with water, but for folks looking to plan a last-minute trip, Magnolia Branch doesn’t put a limit on the number of primitive campsites—meaning you’re virtually guaranteed a spot, even on a busy weekend. There are several options for camping at DeSoto State Park. This state park gets plenty of points for biggest variety both in terms of overnight options and daytime activities. In addition to its improved, primitive, and backcountry sites, DeSoto State Park is home to a wall tent site, four rustic CCC cabins, and the primitive Pioneer Cabin. Start the morning off on the right foot by attending an hourlong session of outdoor yoga (weekend mornings; $5/person), then spend your days canoeing or kayaking a section of flatwater above 104-foot Desoto Falls—the park rents boats for $15/hour or $50/day for five hours—or hiking on the park’s 25 miles of trails. 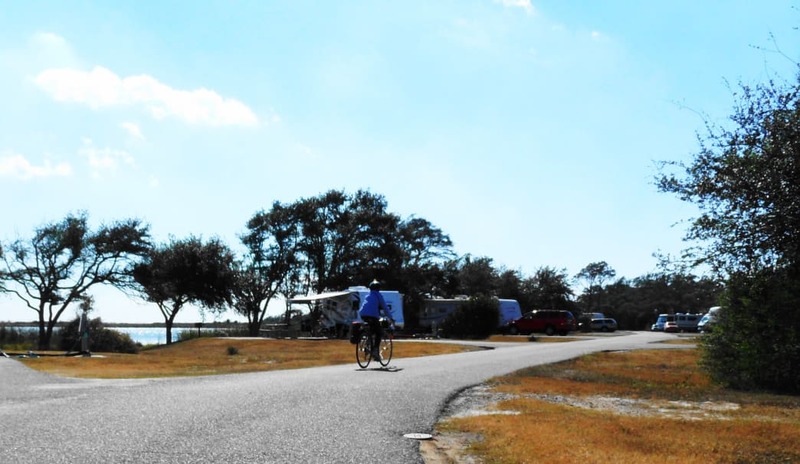 Alabama Gulf State Park has almost 500 campsites, plus 11 primitive sites. Located on the shores of the Gulf of Mexico, the aptly named Gulf State Park is home to 3.5 miles of white sand beaches, along with over 15 miles of hiking and biking trails in the Hugh S. Branyon Backcountry Trail Complex, which covers six distinct ecosystems. The developed campground at Gulf State Park is enormous—it offers nearly 500 sites with hookups—but the park has also added 11 primitive campsites for a more intimate experience. Along with myriad other forms of wildlife, this park is home to alligators, and though attacks on humans are rare, park management asks that visitors stay aware of their surroundings while in the park. Written by Emma Walker for RootsRated in partnership with BCBS of AL.